Add another book to the growing library of guides on how to make information graphics the right way. 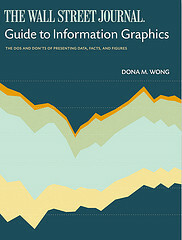 Dona M. Wong, former graphics director of The Wall Street Journal and now strategy director for information Design at Siegel+Gale, provides the dos and don'ts of data presentation in The Wall Street Journal Guide to Information Graphics. Given Wong's background, you can make a pretty good guess about the examples used. They're not graphics from The Journal but they do look a lot like them. The book description also makes a point of highlighting that Wong was a student of Edward Tufte, which was a big hint on what the book is like.